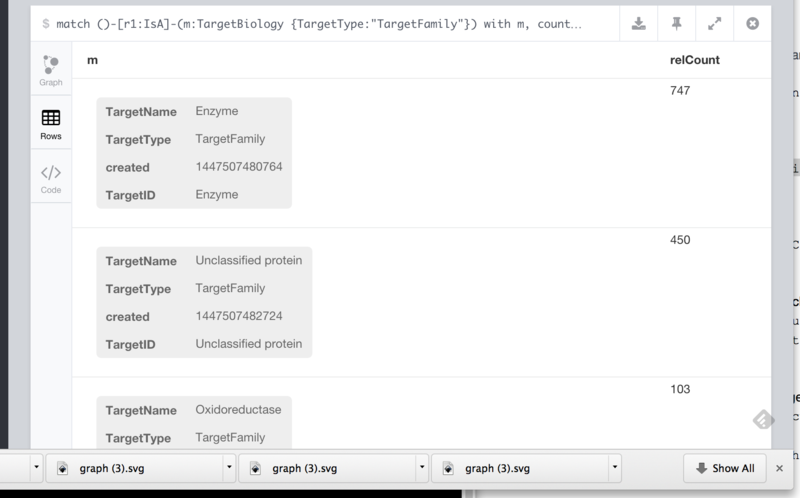 As part of an internal project I’ve recently started working with Neo4j for representing and querying relationships between entities (targets, compounds, etc.). What has really caught my attention is the Cypher graph query language – by allowing you to construct queries using graph notation, many tasks that would be complex or tedious in a traditonal RDBMS become much easier. which is simply a matter of identifying proteins that have a direct path to the Kinase target class. Overall this seems to be a very powerful platform to integrate data sources and types and effectively query for relationships. The browser based view is useful to practice Cypher and answer questions of the dataset. But a REST API is available as well as other tools such as Gremlin that allow for much more flexible applications and sophisticated queries.